With the return of mint marks in 1968, the US Mint produced a 1968 mint set. Ten coins of the Philadelphia, Denver and San Francisco mints were in an envelope in two pliofilm sleeves. The clad coins moved more freely in circulation, and in the uncirculated mint set, the half dollar was the only one containing silver at 40%. 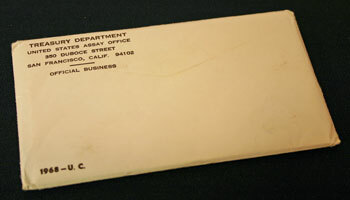 For the 1968 mint set, the US Mint went back to using the plain white envelope to hold the uncirculated coins. In the lower left corner, "1968 — U. C." identifies the set. The upper left corner shows the address of the United States Assay Office in San Francisco (the mint). One pliofilm contains the five coins minted in Denver. The pliofilm has red edges and includes a token printed with red ink. The blue edged pliofilm includes the four coins minted in Philadelphia, the penny minted in San Francisco and a blue printed token. 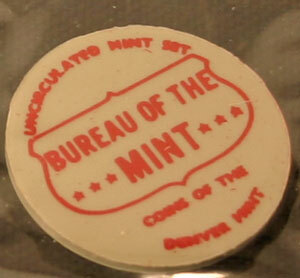 The red printed token in the 1968 mint set identifies that sleeve as having "Coins of the Denver Mint." 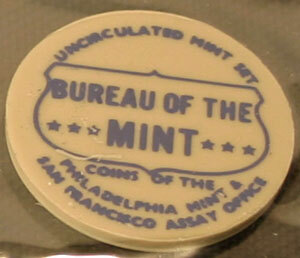 On Jan 4, 1968, the mint marks returned to US coins after being gone since 1964. For coins minted in San Francisco and Denver, they will have "S" and "D" mint marks, respectively. Additionally, with the return of the mint marks, some are moving from the reverse to the obverse of the coins. For example, the mint mark on the nickel will not longer be on the reverse beside Monticello, instead it will be on the obverse to the right of Jefferson and under the date. The previous year, Congress voted to remove any silver backing of the US currency within a year. With the deadline approaching, the US Mint advertised a deadline of June 24 (1968) to turn in the paper money with "Silver Certificate" across the top. A steady stream of people arrived at the San Francisco Mint with their currency which they traded for silver bars at $1.29 per ounce. But, as of the date of the newspaper, those same bars could be immediately sold for $2.25. The comedy "Who's Minding the Mint" released in 1968 included $315,000 in real money. The movie's story line included a bumbling employee of the US Mint who inadvertently took home and destroyed $50,000. He, his love interest, and several nefarious characters planned to re-print and replace the money along with $1 million each for the assistants. On the last day of the silver rush, roughly 500 persons waited in line to trade their silver certificate currency for the silver metal. After Jun 24 (1968), the silver certificate bills will be worth just a dollar. Like the US, Canada decided to change their silver-based coinage to cupronickel. They, too, experienced a shortage in small denomination coins. Canadian authorities contracted with the US Mint to manufacture 75 million new dimes at a cost of roughly $1.5 million. This was the first time Canada had contracted with any other country, except Great Britain, to assist with their coinage. Royal Canadian Mint technicians worked with their counterparts at the US Mint on the dies and the overall minting process. The director of the Mint announced they had received more than the maximum of three million orders for the next year's proof set (1969). Late orders would be returned. Production would begin in January with delivery by mail throughout the year. The 1968 Mint Set Year included news about silver coins and silver certificates.